Here's a quick video of the lovely street mural installed a few weeks ago at a key crossing for the local middle school, complimenting the mural on the other side of the school. There are so many great things about this project, from the fact that it was designed by a student (who also happens to be our neighbor), to how it improves crossing conditions at a key route to and from school (and the local ice-cream shop), and that it brought together the community to create some nice public art for everyone to enjoy. Of course, like all great things there are challenges. 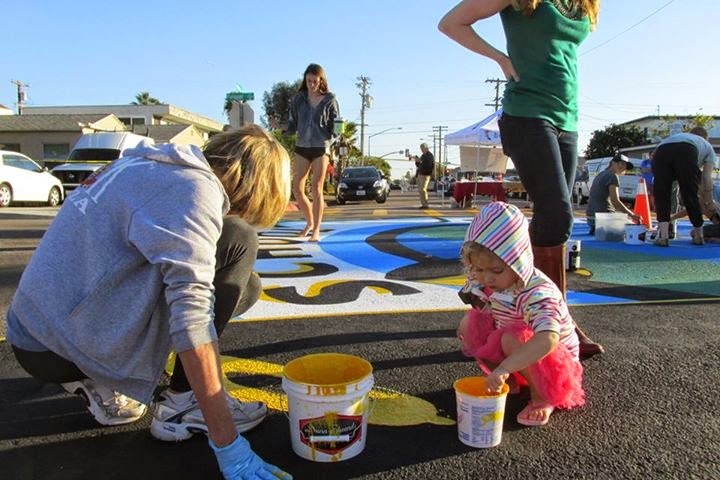 Here in PB, some of the less community-minded locals think it's fun to deface the street murals with tire marks. And for some cities, even getting something so outside-the-engineering-box installed is difficult, as there can be pushback from ever-cautious traffic engineers who worry that street mural crossings won't conform to state and federal design standards. (Note: it is important to consider how the crossings might confuse pedestrians with visual impairments, who rely on regular patterns in crosswalks to lead them in a safe path across the street). Still, it's exciting to see our neighborhood becoming a little more safe and beautiful every day!